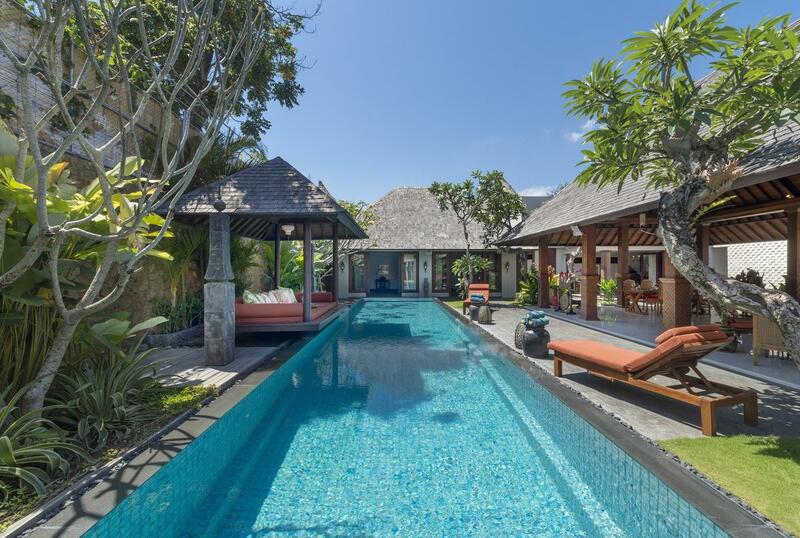 The villas comprises two stunning new villas quietly tucked away within Seminyak’s exclusive Laksmana Estate, moments from the surfing beach of Petitenget and some of Bali’s most iconic restaurants and bars. 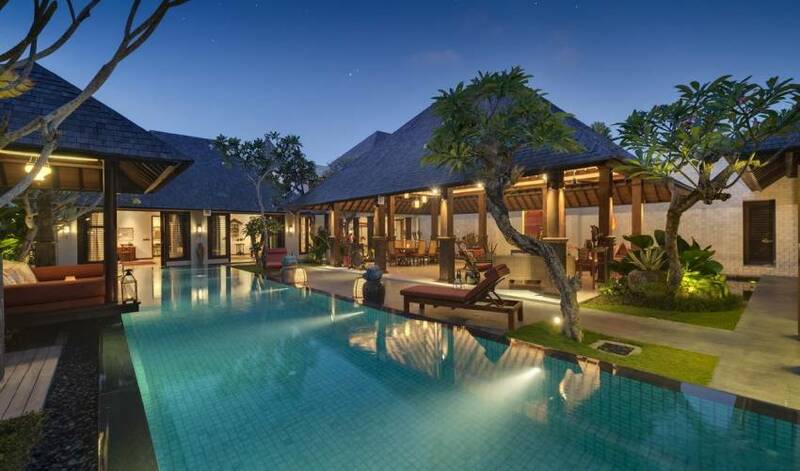 A fusion of Bali-style open living and contemporary Asian design, the two interlinking villas each have their own entrance, swimming pool and living area as well as air-conditioned bedrooms and bathrooms. They can be booked separately or together, offering the versatility of a two-, three- or five-bedroom villa vacation – well suited for multi-generation families or groups of friends who appreciate both space and privacy. 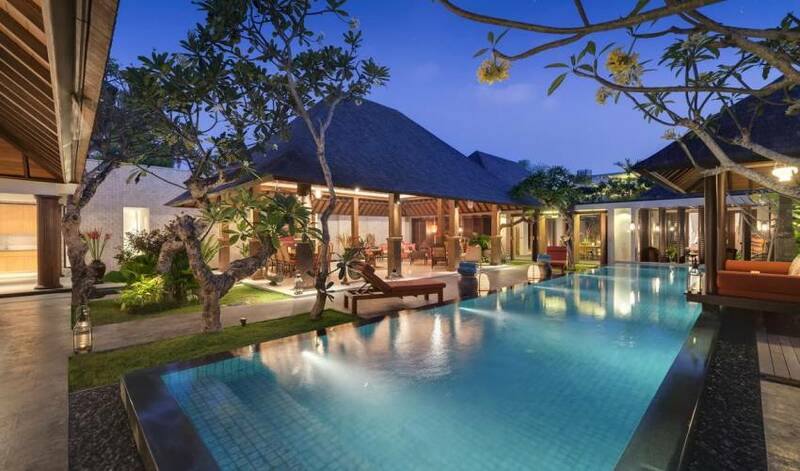 The two bedroom and three bedroom villa are an exceptional pair of fully staffed pool villas within the ultra-elite Laksmana Estate in the heart of Seminyak, moments from Petitenget Beach. Named after Holland’s legendary hotel, this inter-connecting pair comprises two sets of vaulted pavilions arranged around inviting swimming pools and divided by a wall of double doors and pivoting plantation shutters that can be opened up when both villas are rented together or closed off for complete privacy. A wealth of natural materials features in the design – teakwood-lined ceilings and floors, Palimanan stone reliefs, wall panels of padded linen, bathrooms of Italian marble. Every room is richly decorated with colonial-style furniture, prized antiques, precious Asian ceramics and artefacts, and oriental rugs. Among the more contemporary luxuries are top-range King Koil mattresses, crisp cotton bed-linen, and curved 47-inch TVs with satellite channels in every bedroom. Pick up one of the many books lying around, and retreat to the antique daybed in the two bedroom villa or the poolside balé in the three bedroom villa. 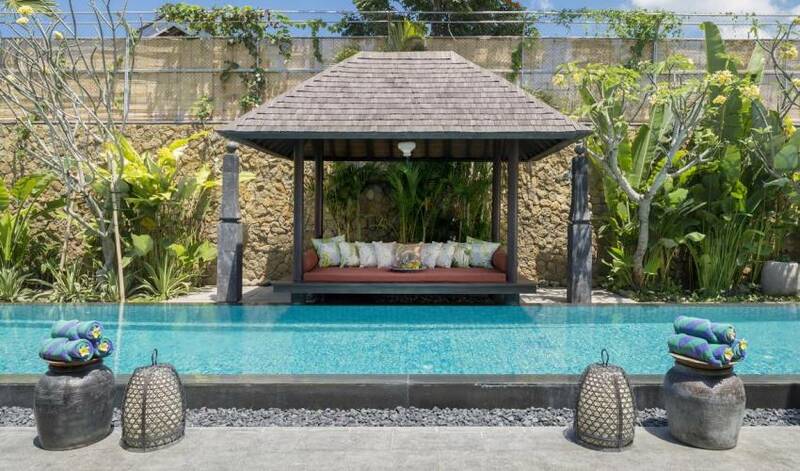 Take a siesta on a sun lounger then cool off in the pool. Take a leisurely stroll to Ku De Ta for sunset cocktails, and dine at La Lucciola across the road, or return to the villa for a gourmet meal created by your accomplished chef. Then retreat to the air-conditioned comfort of your spacious bedroom, sink into a petal-strewn bathtub and finally retire to your four-poster bed. Repeat the next day. 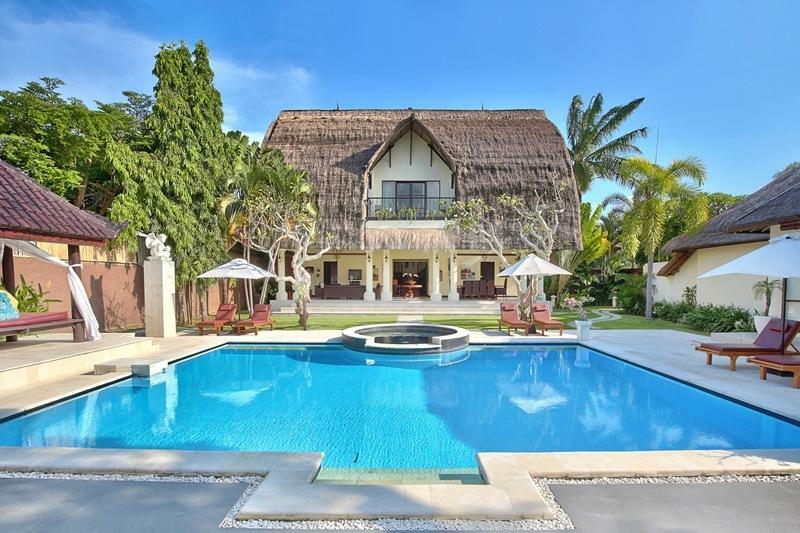 With the beach, boutiques, restaurants, bars and spas of Seminyak just moments away, families and groups of friends will find the villas the perfect choice for their Bali vacation. From the two bedroom villa's bright red iron-studded door, steps across a small pond lead into an open-sided living area then onto a covered poolside dining pergola and second seating area. Behind the living area is the master bedroom pavilion opening onto the length of the pool terrace, facing the guest bedroom pavilion on the other side. Plantation shutters and a set of three doors run the width of the living areas and divide the two bedroom from the three bedroom. These can be closed off for privacy or opened when both villas are rented together. 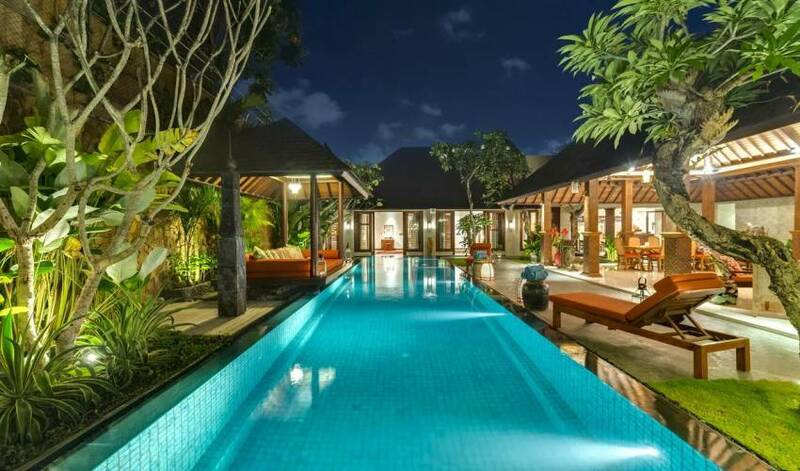 Accommodation at the three bedroom villa is in three adjoining pavilions arranged in an L-shape around the 16-metre swimming pool. The social heart of the villa is the huge open-sided living pavilion facing the length of the pool, across which is a large balé. 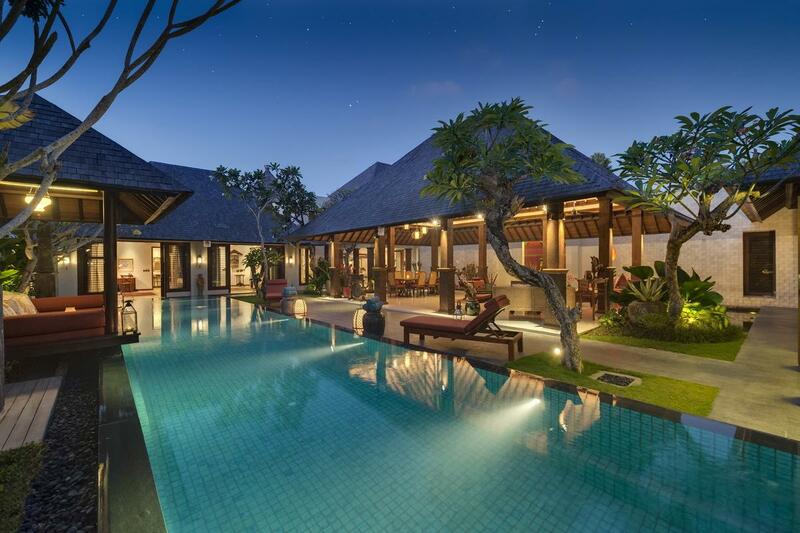 To the right is the sleeping pavilion with two large bedroom suites opening onto the pool terrace. Tucked into the corner of the L is a two-storey building with seating area, bar, kitchen and guest washroom downstairs and, above, a third bedroom suite with a terrace. A wall of plantation shutters and three sets of doors separates the three bedroom villa from the two bedroom villa, which can be closed off for privacy or opened when both villas are rented together. Under a vaulted teakwood-lined roof rises a magnificent four-poster bed swathed in mosquito netting. Colonial-style furniture, antique porcelain and oriental rugs enrich this air-conditioned master suite – even the ultra-modern 47-inch curved TV has a magnificent backdrop, set before an ornately carved mirror-backed geometric panel. The bathroom is just as beautifully decorated, with a dressing area, bathtub framed within a garden alcove, twin basins, and walk-in shower enclosure with pool view. 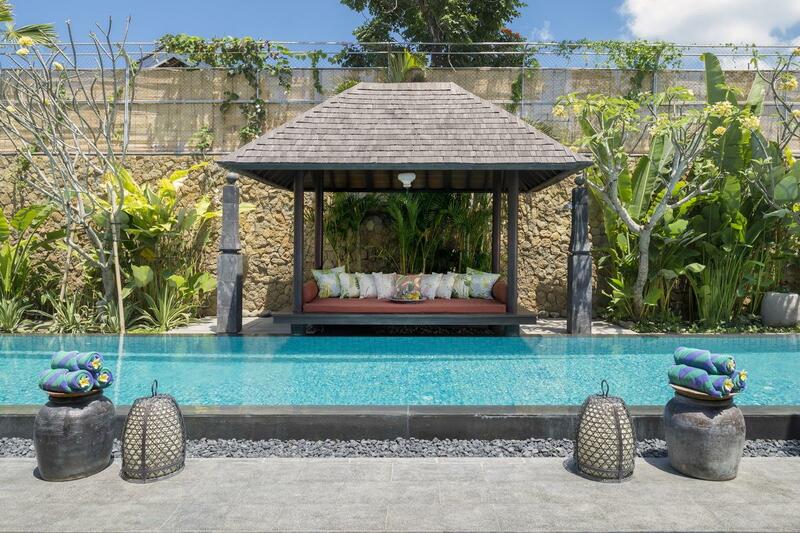 The air-conditioned guest pavilion also looks out over the pool, with extra-wide sliding glass doors opening onto the terrace and, when the plantation shutters are open, a view across the pool of the three bedroom villa. Twin beds (that join to create a king-size bed if preferred) rest under a towering mosquito net on an over-sized platform. An antique-style rocking chair is perfect for watching movies on the 43-inch satellite TV, and beyond a linen-padded wall lies a dressing area with wardrobe, and a bathroom with bathtub, large shower enclosure and twin basins. The three bedroom villa’s bedrooms are spacious and handsomely designed, with high teakwood-lined vaulted ceilings, polished wood floors, and custom-designed display cabinets. They each feature a large four-poster bed, colonial-style furniture, oriental rugs, and striking art and artefacts – a rich visual counterpoint to the ultra-modern 47-inch curved TVs with satellite channels and DVD players. 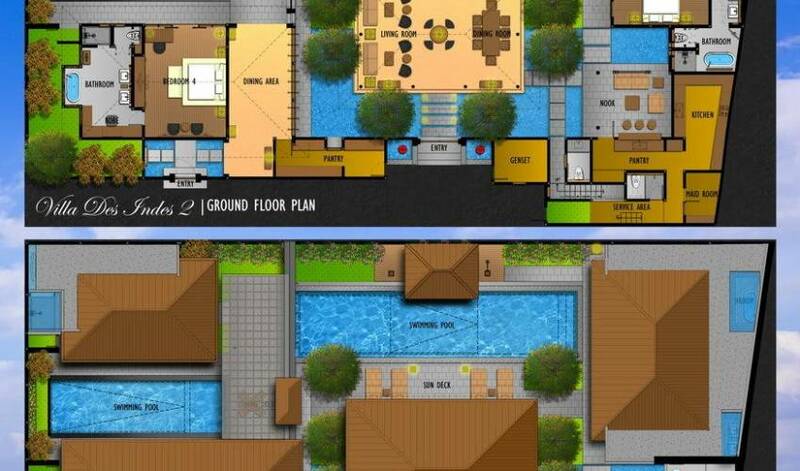 The upstairs bedroom has its own roof terrace while the two ground floor bedrooms open onto the pool terrace. All three feature fans and air-conditioning as well as a large air-conditioned marble bathroom with dressing area, bathtub, twin basins, and walk-in shower enclosure. 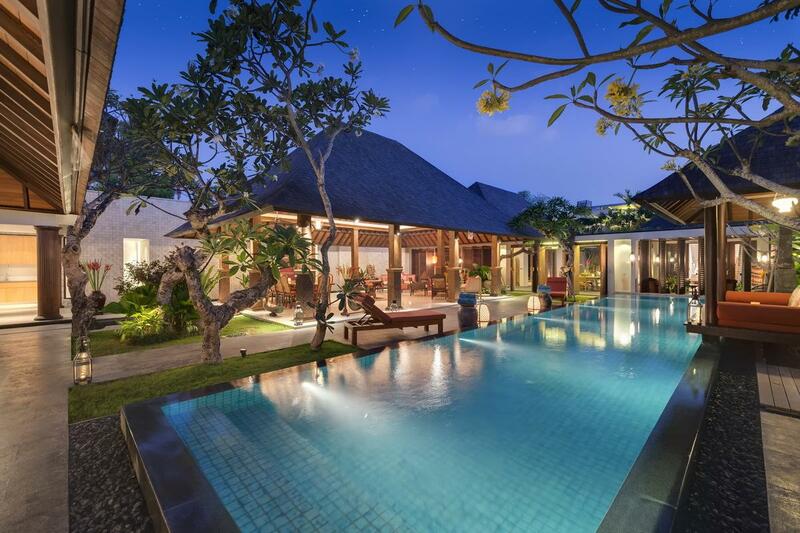 The villas sits securely within the Laksmana Estate, an exclusive enclave right in the heart of Seminyak. Bali’s most stellar beach area – the wide expanse of Petitenget Beach is a mere five-minute walk away. Many of the island’s most celebrated restaurants and bars are a short stroll away, including Ku De Ta, Metis, Sarong and Potato Head. 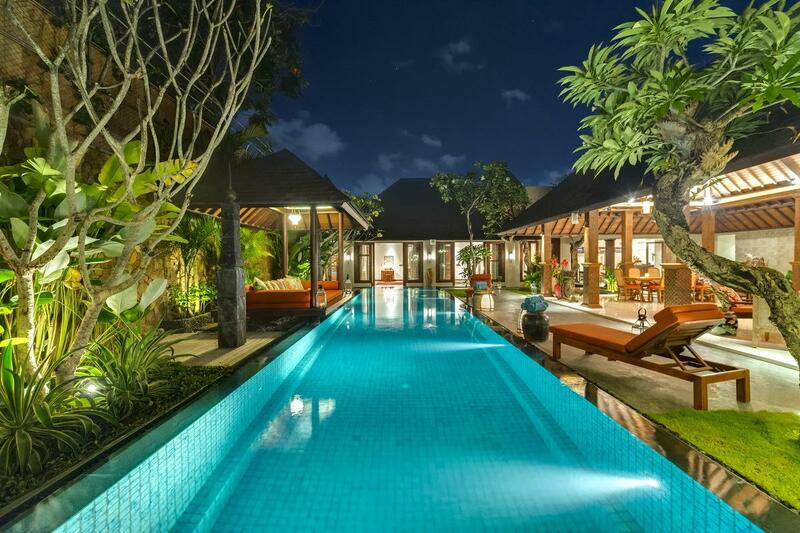 No need to take a taxi to reach Seminyak’s many boutiques, lifestyle shops and spas either. What a perfect spot!